Valentine's Day promises to be chilly, and I can think of no better way to warm up than with a stiff bourbon-based cocktail. 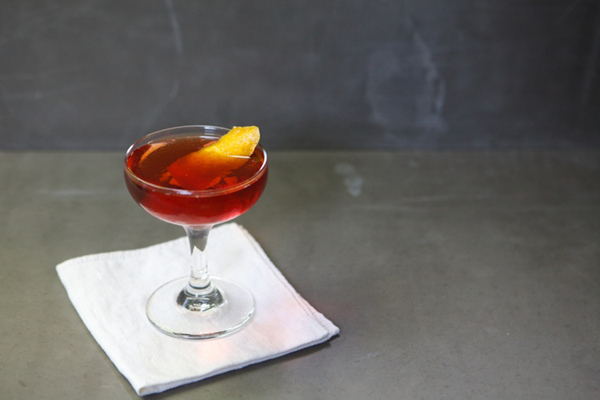 The rose-red Boulevardier is a classic riff on a Negroni that'll have you happily curled up next to your sweetheart come Sunday evening. Combine ingredients in a cocktail shaker with ice. Shake for 10-15 seconds; strain into a chilled coupe. Garnish with a orange peel. Notes: The Boulevardier is my bar litmus test, and I had by far the best one yet at Dallas' Filament over the holidays. The bartender swore by the equal proportions I've given above, and used Old Grand-Dad, Cinzano, and Campari for a perfectly romantic cocktail that I still can't stop dreaming of. That said, the only ingredient that's a real must here is the Campari; use your favorite bourbon or whatever vermouth you have on-hand. Cheers, and happy Valentine's Day!